Here's a story for ya that turns into a rant. I wanted to play, "Red Dead Redemption 2," on my PlayStation 4 so I used some money I had saved-up through buying and selling things (comics, Funko Pops) to purchase, "Red Dead Redemption 4," on Saturday at a nearby Best Buy while running errands with my wife and son. Once we got home I excitedly put the first disc of the two (the, "Data," disc) into my Ps4. The console made some odd sounds as it had been doing a bit lately, with the copying lurching a bit but it eventually said to use the next disc. I did so and then it quit working at all, saying it would be 99+ hours to install. I looked online and tried tips to fix this from disconnecting from the internet to unplugging the Ps4 for a couple minutes. Nothing helped. I deleted the progress and started over with the first disc again, only for it to go even slower and then crash. On the third attempt basically nothing happened. I looked into it and as my PS4 is older it seems quite likely the disc drive is mostly shot, barely able to play DVDs and such but not games. I realized I'll need to probably get a digital copy of, "Red Dead Redemption 2," and thought it would be easy to return the game. Dear God, was I wrong. I arrived at Best Buy with my game and receipt. I explained the issue I was having and how my PS4 was unable to even play the discs. I was given a B.S. made-up reason about, "Copyright laws," that they can't take the game back once I opened it and could only exchange it. No matter what I said I was told no. Now, when I've bought games at other stores both in-person and online I've been able to return them in certain cases, and this was a unique case. I was told it was impossible though and I could get another game...which they would then open to (I assume to prevent someone from then just returning that one, which is what I would have admittedly done). I understand store policies but also know from my time in retail things can have an override for almost any reason in the system when one has special cases, plus I didn't appreciate being lied to about why they would refuse to take the game back and issue a refund. I realize there are concerns about piracy too, but in this era would someone really buy a game to pirate or just download some files online? 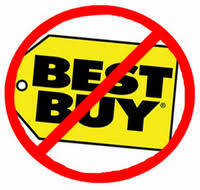 It was stupid, and illustrated to me how one should never buy games from Best Buy, or any stores with such idiotic return policies. For anyone wondering, I sold my copy to a friend at a loss of a few bucks and bought a digital copy that was cheaper than retail thanks to no sales tax.